For Clarinet in B-flat. Includes printed musical score for B-flat instruments (soprano sax, tenor sax, clarinet), and a compact disc featuring complete recordings (with alto sax as the solo instrument), and a second performance of the accompaniments only. Published by Music Minus One. This sequel to 'For Saxes Only' offers a series of saxophone quartets (rather than the typical 5-piece arrangement from the big-band era), to further enhance the importance of each instrument. 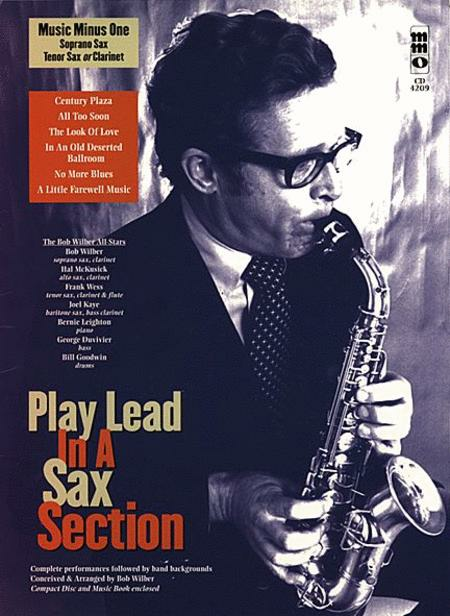 Hal McKusick performs alto sax in a complete version to give samples for the improvisational sections, and you have the option of playing the solo (which has been notated from the complete version) or improvising your own. Join Wilber and his great colleagues and share in the musical romp! This album is easily usable by tenor sax, soprano sax, or clarinet players. Soloist: Hal McKusick, solo alto saxophone. Ensemble: Bob Wilber All-Stars: Bob Wilber, soprano sax/clarinet; Frank Wess, tenor sax/clarinet/flute; Joel Kaye, baritone sax bass clarinet; Bernie Leighton, piano; George Duvivier, bass; Bill Goodwin, drums.